Did You Procrastinate? It's Not Too Late! You DID procrastinate, didn't you? That's ok, we've got your back! All domestic orders between today and December 19 will be upgraded to expedited shipping for no extra charge. We guarantee delivery before Christmas or we'll refund your shipping! Being last minute doesn't mean you have to settle for boring cliche gifts like scented lotion baskets or hot chocolate gift boxes. We've highlighted some extra popular gifts from Beachcombers. There is something for everyone from fake taper earrings to henna tattoo kits in every budget. Be sure to take advantage of 25% off bindi body stickers for stocking stuffers. They make great festive handouts on Christmas day. Buy one pair of our spectacular organic earrings and get one pair 50% off! Spend over $50 and get FREE shipping too! Didn't I tell you we've got your back? This is your chance to get our spectacular organic earrings for regularly pierced ears at a discount. Buy one pair of earrings, get the second pair for 50% off! Our hand carved earrings are made for us in Bali by our master carver Wayan. He is a real artist and I love wearing his work. Though our earrings look like gauged or expander style earrings, they are all for normally pierced ears. Woop! Combine with our great free shipping offers and our bindi sale for an even bigger value! A great discount on a great stocking stuffer! TODAY, buy 5 bindi packs and get a 25% discount! Bindi body stickers are also terrific for tucking into Christmas cards or holiday gift certificates. I like to have a few packs in my purse so I can give out bindi at Holiday gatherings. Everyone loves a little sparkly to wear for a night...especially little girls! Buy Sparkly Bindi Body Stickers Here! Have fun during this season of joy! It's not too late to get items for Christmas delivery. If you have any questions about delivery, contact us via email or phone. *Guaranteed delivery applies to domestic USA orders only. Cleared payment must be received by 1:00 EST on stated dates. Delivery confirmation and tracking included. Not responsible for unclaimed packages or packages awaiting pick-up at your local post office due to attempted delivery. Anyone Can Create Henna Tattoos! Doing henna tattoos yourself is easy and fun! Mehndi or the art of henna has been practiced for thousands of years by people that were not formally trained. In fact, the vast majority of henna artists are self taught! Anyone can do henna! Everyone! Henna is done by women, of course, but also by men. Some of the best henna artists I know are men. I know henna artists of all ages, 9-81 and all cultures, American, Latin, Indian, Swiss, and German, among others. This means henna makes a great gift for any interested in henna or anyone crafty! What is the best henna tattoo kit for a gift? When selecting a henna tattoo kit for a gift, there are multiple things to consider. Is the kit SAFE, body-art-quality henna? This is the most important part of buying henna. Only buy henna from a good reputable supplier that knows their stuff and stores their henna properly. Many times, things are called henna and sold as henna but are not henna at all or they may contain henna along with very dangerous chemicals. Do not buy a generic kit from Big Box stores. These are kits that contain very little henna, poor instructions, and stale henna product. Many also have chemical additives. Beachcombers Bazaar's henna products are always high quality, fresh, BAQ that are stored properly. Whatever henna kit you decide on from Beachcombers will be absolutely safe and high quality. Are there good instructions to do henna? Most henna products come with no instructions, poor instructions, or just plain wrong instructions. To have a good experience doing henna, especially for the first time, you need good clear instructions. All henna kits at Beachcombers come with a instructional and design booklet that contains everything you need to know about doing henna. These aren't translated instructions. The entire booklet and all the henna designs were created by me, Jody. We also offer our online free Henna Learning Center, packed with tons of great henna information. Most instructions can be printed to make it even more useful! Is the henna kit a good value (do you get plenty of actual henna product)? Many henna kits give you fancy packaging, cotton balls and other useless "accessories", but little actual henna product. Beachcombers henna kits have tons of actual henna. This allows you to play around and make a mistake or two without wasting all your henna. I don't bother including things that you already have at home, so your money goes to quality henna product. What does the giftee want to accomplish using henna? Is this just for doing some henna tattoos once or twice? Will henna become an ongoing personal hobby? Do they want to eventually do henna on others for money? A smaller henna kit, such as our Fun & Easy Henna Kit, with ready-made henna is just fine for the newbie that just wants to do henna a couple of times. 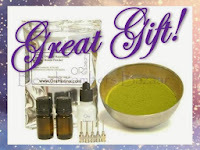 If someone wants to make henna an ongoing hobby or do henna on a professional level, a henna kit that includes powder henna or a combination of ready-made henna and powder henna is better. This is an important question too! Purchase the best henna kit in your budget from Beachcombers and know that you are getting a great value that includes high quality henna and high quality henna accessories. This is perfect for the henna newbie that is just doing henna for fun. At only $14.99 it's priced at a great level for gifts for teenagers. Give a teenager the Fun & Easy Henna kit, and you will have given the most exciting unique gift at the party! Perfect for anyone that may make henna an ongoing hobby or want to do henna on a professional level. Mixing your own henna is one of the most important parts of learning about henna. 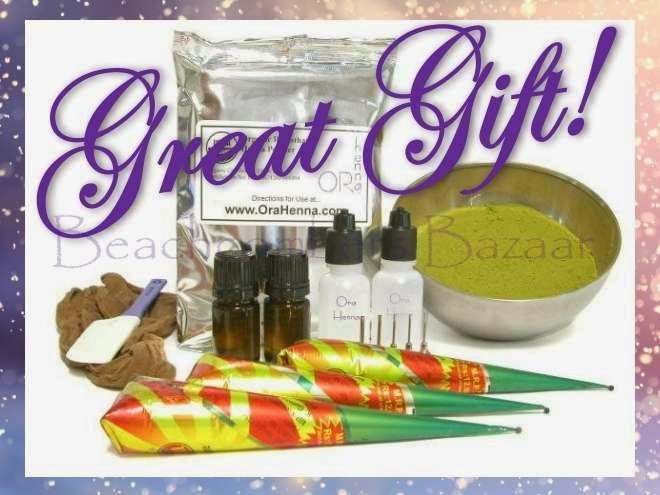 Including 100 grams of henna and all the basic henna tools you need, this easy henna kit will let the giftee practice and play while learning the art of henna. No worries about running out of product soon, because you can get 100-300 henna designs from this henna kit! Ahhh! This kit is just what is says it is...big and bad! It has both powder henna and ready-made henna along with even more henna accessories than the Essential Starter kit. It even has transfer paper for those that are worried they are not artistic enough to do henna. This is a high impact gift! Questions? Contact me! I'm happy to help you decide what henna kit you need.